Known for making gadgets part luxurious and part ostentatious, Stuart Hughes unveils the Nintendo Wii Supreme, a popular gaming console loved by many covered in over 2,500 grams of solid 22-carat gold and 19.5 carats of diamonds on its three front buttons. Call it a luxury item, a fashion statement, or a waste of valuable recession money, but we all know that someone out there is going to purchase these golden toys. 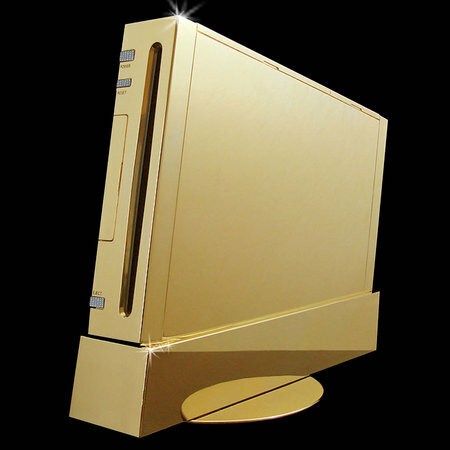 The company states that only three of these gold-plated Nintendo Wiis were created in over a span of six months. The Nintendo Wii Supreme is available on Stuart Hughes online store, costing £299,995 (or about US$484,818).